Pope Francis had created a “bedlam of divergent opinions’’ and turmoil inside the Catholic Church a leading US theologian vising Sydney has warned. Father Thomas Weinandy, 72, is a mainstream theologian and member of the Vatican’s 30-member International Theological Commission, the church’s most senior theological advisory body. 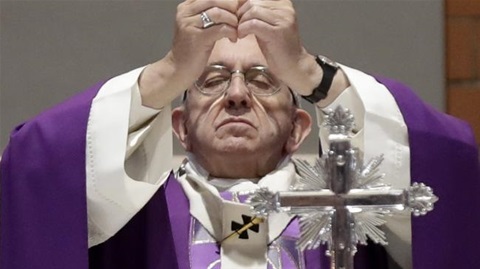 He said the Pope’s ambiguous teachings over marriage, divorce, Holy Communion and other faith and moral issues had caused confusion and division among people, priests and bishops. “By seeming to encourage doctrinal division and moral discord within the Church the present pontificate has transgressed the foundational mark of the Church — her oneness,’’ Father Weinandy told a Notre Dame University conference on Saturday. “It would appear that Pope Francis identifies himself not as the promoter of unity but as the agent of division. In a move that blatantly cast aside the right to free speech and debate, Father Weinandy, a Franciscan Capuchin friar who teaches in Washington DC, was forced to resign as a consultant to the United States Conference of Catholic Bishops last year after releasing a copy of a critical letter he had written to the Pope. The president of the US Catholic Bishops conference, Cardinal Daniel Di Nardo of Galveston-Houston, said Fr Weinandy was sacked because he had failed to put “a good interpretation’’ on Francis’s teaching. In an interview with The Australian during his visit to Sydney, Fr Weinandy defended the right to free speech on religious matters. Last week, one of Pope Francis’s closest advisors, Italian Jesuit and editor Father Antonio Spadaro called in a tweet for EWTN (a US-based international Catholic television network that reaches tens of millions of homes via cable) to be put under “interdict’’ (one step short of ex-communication). He called for the severe penalty to apply “until they get rid of Raymond Arroyo’’ – one of the network’s most prominent journalists who has been critical of Francis. The Vatican’s increasing politburo-style sensitivity to criticism comes as it edges closer to a deal with the Chinese government. The deal, which has alarmed Hong Kong Cardinal Joseph Zen and many Catholics in Hong Kong, Taiwan and in China’s Underground church, would hand control over the appointment of bishops to the Communist Party state. The deal is being finalised as Chinese president Ji Xingping, 64, an avowed atheist, has effectively proclaimed himself Chinese emperor for life through constitutional changes. Last year, the head of China’s religious affairs regulator, Wang Zuoan, director of China’s State Administration for Religious Affairs wrote an article in the Communist Party’s magazine telling its 90 million members they “should be firm Marxist atheists, obey party rules and stick to the party’s faith ... they are not allowed to seek value and belief in religion” or face punishment.